“South of the border, down Mexico way. That’s where I fell in love where stars above, came out to play. We first enjoyed fish tacos while vacationing in Maui. There’s a great little Mexican place in Lahaina’s Cannery Mall called Compadre’s that served some of the best Mexican food we’ve ever eaten. When we get a craving for this dish we’ve found it’s best to just make it at home because, sadly, the Mexican restaurants in Minnesota don’t even come close to recreating the tacos the way we remember them. The fish for these tacos can either be deep fried in beer batter or grilled. This time we opted for the lighter grilled fish, but the tacos are fabulous both ways. Grill 16 to 20 oz. fresh, mild fish (such as cod or haddock) that has been rubbed with a little cumin, paprika, and cayenne pepper. Rub a little olive oil on both sides of 10 small corn tortillas. Working in batches, lightly brown them in a skillet. Grate a few cups of extra sharp cheddar cheese. Stuff warm tortillas with cheese, fish, slaw, and tomato topping. Squeeze fresh lemon juice over the tacos. Top with a little sour cream. 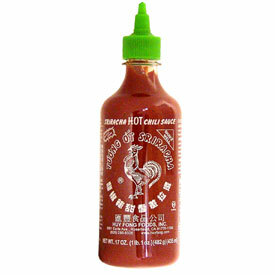 Season with plenty of Sriracha hot sauce if you like spicy. Cooking Tip: Many people already know the trick for removing the scent of fish from your fingers…LEMONS! But here’s a trick I learned from my Italian grandma, Darling…to effectively remove the scent of fresh garlic, rub your hands with a handful of coffee grounds. Works every time! Can the fish be Talapia and pan fried in a cast iron pan? I usually dip in Italian seasoning, beaten egg and back to the seasoning. Do you think this would work? I don’t like cod or haddock…. You could use any fish you like, and prepare it your favorite way. Tilapia would work just fine. And if you like crab, lobster, shrimp or scallops…these would be great too. Let me know how your version turns out! To get rid of the garlic / onion / etc smell from your hands… Here is another trick – simply wet your hands and then rub them on your chrome or stainless steel faucet!! YUMMMOOOOO!!!! Shrimp & Fish tacos are a favorite!!! I always order them when I’m out, but need to make them at home more. So fabulous! 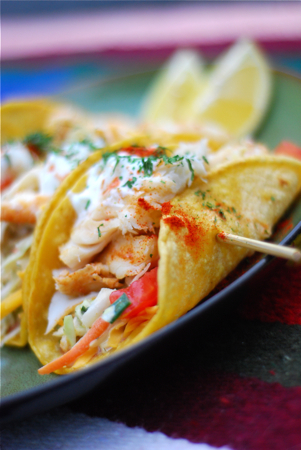 These look like some very healthy and tasty fish tacos! That Sriracha must make them spicy! My kind of tacos! Beautiful pictures and a great recipe! they’re awesome! one of my favorite treats from the grill. xoxo and thanks for commenting! I love grilled fish tacos. Yours look spectacular. I’ve never thought to pump up the heat with Sriracha! Exactly the place where I first had a fish taco! It never appealed to me before and, just like you Melissa, I have NEVER been able to replicate that Maui fish taco in Michigan or anywhere else really! Thanks for the recipe! Love the recipe. Just wanted to mention that simply rubbing your hands on the stainless steel sink with the water running on top also removes garlic odor from you hands. Some cooking shops even sell little stainless steel “soap bars” for this but the sink works just fine. This is what chefs do. These look awesome. I’ve been looking for a grilled fish taco recipe to try. One of my favorite recipes, Patsy! Thanks for visiting 🙂 enjoy! This look so good. I’ve only had a Greek version of a grilled fish taco, but loved it too. Tangy green and red cabbage, grilled fish fillet and served with a Greek pasta salad with feta. Will try this version. Love simple tasty recipes. I had it at a shop in Morgantown, WV, called Taziki’s. I’ll look next time I go there and see what the item says. It might have an online presence that you could see too. I love their baklava, their pasta salad, hummus, dolmedes, shrimp salad, a beef tenderloin sandwich is my brother’s favorite with a garlic sauce. Nice place. I only get to go there when we are up for doctor’s appointments. can’t wait to hear more about these. I’ll look them up and see if I can find them online 🙂 thanks, Ruth. When I vacationed in Charleston I ate at a place called Taco Boy in Folly Beach and they have amazing fish tacos!!!! That was the first time I had them and I am hooked, I am so excited about finding this recipe! They used Mahi Mahi and it was mild and delicious. I also recommend a Mojito to go with it, it really brings out the flavors! This is a wonderful recipe, but I just wanted to point out that when I had fish tacos in Mexico they were almost always served with a little fresh cilantro. I don’t usually like cilantro, but it really can enhance the rest of the flavors in this recipe. I agree, when I was in Mexico they almost always served their fish tacos with cilantro (and almost every other dish too, for that matter.) I didn’t add cilantro to this recipe on purpose. 🙂 Here is a more comprehensive post that includes a sort of list of my experiences making and eating fish tacos. Thanks, Melissa, they all look amazing!!!! Thank you for a great recipe! Do you have a reccommended coleslaw dressing recipe? I think I will try this with cilantro as well. I am a recently decided vegetarian and found a great recipe for chic pea tacos. Basically you toss taco seasoning spices with a can of chic peas and place in taco shells and top with lettuce and taco sauce. Yum! This recipe is absolutely amazing!!! I’m not a big cole slaw fan but my family is and they love the flavor the green onion gives the cole slaw on this fish taco. For myself I usually fill my Taco with fish, shredded cabbage, cheese, sour cream, green onion and a little siracha and it’s absolutely amazing. When I first made this recipe I loved it so much I made it for a week straight! Thank you for the wonderful recipe that is now in my cookbook and family’s heart.